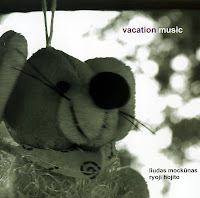 Japanese pianist Ryoji Hojito goes to Lithuania on holidays. He meets with reedist Liudas Mockūnas and they play music, spontaneously, improvised, first in a studio, with some stuff recorded a year later in St. Kotryna church in Vilnius during the next vacation, then packaged the thing to share it with us. I did not know Hojito, I must admit, and I know Mockūnas only from his collaboration with Mats Gustafsson on "The Vilnius Explosion", and he impresses again. The album starts with "Sunday", in an impressionistic way, with tentative piano chords, and tentative bass clarinet, for a slowly unfolding lyrical dialogue, full of joy and control, evolving into the next piece, "Monday", into a more meditative and melancholy vein, with Mockūnas blowing some heartrending pieces on his soprano, but gradually the mood changes, as does the tension, with Hojito adding small percussion and some quicker runs on his keys, pushing the sax into somewhat more frenetic regions, supported by sudden accordion sounds. By "Tuesday", raw baritone blasts are met by extended techniques on the piano. We're in church on "Wednesday" for a solo piece on tenor by the Lithuanian, deeply emotional and dramatic, filling the space with plaintive phrases. "Thursday" starts avant-garde, with the Japanese singing and squeaking toys, and rattling all kinds of stuff, somewhat reminiscent of Nana Vasconcelos. Mockūnas' response and ensuing phrases are to the point and beautiful, somewhat romantic but with loads of character, and the real fun sets in when Hojito starts using his keyboard, for staccato runs, resulting in some astonishing interplay, of the kind that many musicians would like to accomplish after lots of rehearsals, but here it comes naturally, free-spirited and again full of joy. "Friday" is more contemplative and slow, warm and sensitive, with the soaring soprano being supported by the prepared piano, in a great contrast between crystal-clear and distorted sounds, evolving towards more uncharted territories. "Saturday" ends the week in darker environments, full of gloomy deep circular breathing tones and irregular percussive attacks on the piano strings, voice and other objects. The only (again!) pity is that the applause of the apparently large crowd that opens the live performance does not end the album too. Too much said already, what a duo, bringing absolutely captivating music from beginning to end. A real find. A musical vacation. Highly recommended.